"Moneikos" C 112 , the latest motor yacht of the Codecasa 62 series, was launched last June by the Codecasa Tre Shipyard of Viareggio in the province of Lucca. It was designed in conjunction with the naval Architects Franco and Annamaria Della Role, who were responsible for both the exteriors and interiors of the yacht the latter being designed with the contribution of the Studio Dedalo of Turin. 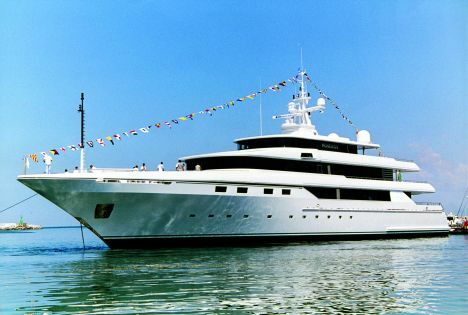 "Moneikos" is a five decker motor yacht with a keel of "High Tensile Steel AH36", and a superstructure in "Aluminium 5083 H111/321" built in accordance to Lloyd's Register and MCA directives. The decks offer ample accommodation for 16 guests who can reach each deck via a comfortable internal lift and who may use four VIP suites and three twin bedded cabins plus the owner cabin with double bed. The crew instead enjoys seven separate cabins with single births, plus one cabin for the Chief Engineer and the Captain respectively. Further to this accommodation we can find spacious saloons complete with the latest entertainment equipment both below deck and at top deck level which also hosts up forward the Owner's vast suite with a 180° view of the sea. On the same deck we can find outdoor lounging areas both forward and in the stern as well as a charming dining area. The sun deck instead offers an internal area dedicated to the bridge and of course an outer area decked out for soaking the sun complete with swimming pool of generous proportions. For further information please contact: Cantieri Navali Codecasa Tre, Via Amendola; 55049 Viareggio (LU); tel. 0584-384092/3; fax 0584 384323; web site: www.codecasayachts.com; e-mail :info@codecasayachts.com. Class : Lloyds's Register Malta Cross 100 A1 SSC "Yacht" Mono G6 Malta Cross LMC RINA Malta Cross 100-a-1.1 "Y" - MCA.